As in the previous years, the Assam Government will observe Anti Terrorism Day, along with the rest of the country, in all the districts and sub-divisions on Monday. Directives have been issued to all the heads of the districts and sub-divisions to observe the day in appropriate manner by taking the Anti Terrorism pledge at 11:00 am. The programme will also be observed and the Anti Terrorism pledge administered at the Assam Secretariat at 11:00 am. 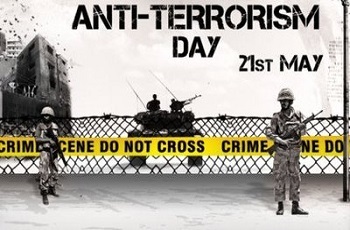 Anti Terrorism Day is observed every year throughout the country on May 21. It was on this day in 1991 that former Prime Minister Rajiv Gandhi was killed in a human bomb explosion. The objective behind the observance of Anti-Terrorism Day is to wean away the people from terrorism and violence. On the occasion, debates, discussions, symposia, seminars, lectures, etc are held in schools, colleges and universities on the dangers of terrorism and violence. Many NGOs, social and cultural organizations also organize their own programmes to highlight the ill effects of violence and terrorism. Anti-terrorism/anti-violence pledge is taken in all Government offices, public sector undertakings and other public institutions.